Play Therapy in Galway with Helplink is for children aged 3 to 10 years old. For young children aged 11-15, we offer our Creative Therapy service and a Youth Counselling service. Play Therapy allows children the time and space to work out what may be troubling them. We want to help each child to fulfill their full potential. Most importantly, it allows them to express their feelings through their most natural method of communication – PLAY. We believe play is one of the most important vehicles for children to know and accept themselves and others. We want to make sure that all children feel comfortable at our sessions. Due to this, we encourage the child to express the negative or difficult emotions through their actions. The therapist is able to track and observe what is happening and gently guide the session when necessary. The therapist provides the space which allows the child/young person to play as they need to. As a result, our sessions have as little limits as possible but as many as is necessary for physical and emotional safety. All play/creative therapy sessions are confidential. Therefore, details of the sessions shall only be disclosed in line with child protection procedures. Who is this Play Therapy Galway for? We believe at Helplink that any child over the age of 3 years can benefit from play therapy. This type of therapy nurtures creative thinking, builds self-esteem, confidence, resilience and much more. Furthermore, play therapy can be specifically used to support children with any emotional or behavioural difficulties. Ones who have suffered bereavement/loss, suffering with anxiety. Also, it can help children who are having any family issues. Naming only a few, there are a wide range of benefits for children from Play and Creative Therapy. Creative therapy is for older children aged 11 to 15 as above this service can assist these children across multiple areas. At this time appointments are only available in Galway City. I did just want to drop you a quick line to say thanks for all the work you did with our son this year. He is much more content, and has none of the issues he had when we first made the referral. He still experiences big emotions, but seems better able to manage and understand them, and even better still he can now say he is proud of himself which is not something I expected. This was something he never said before and would shy away from, but he has grown in confidence over the last number of months. Denise Gordon: is graduate of NUI Galway and the Academy of Child and Play Psychotherapy. Denise holds a Postgraduate Certificate in Practice Based Play Therapy (NFQ:Level 9). Denise has also completed her Degree in Arts with Children Studies (NUIG). All of Denise’s work is guided by the Play Therapy International Framework and she is a member of Play Therapy Ireland. For more on Play Therapy Ireland, you can visit their Website at http://www.playtherapy.ie/. Furthermore, Denise is supervised, insured and Garda vetted. 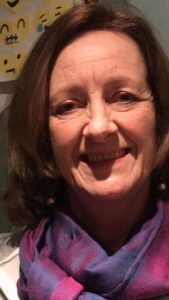 Anne Chaill: is a graduate of St Nicholas Montessori College Ireland & has many years experience working with children. She holds a primary degree in Education & Training (NUI, Galway) along with a Post Graduate Diploma in Practice Based Play Therapy, awarded by NUI Galway & the Academy of Play & Child Psychotherapy (QQI Level 9). *Employed Parents/Carers can also buy a bundle of 8 appointments for 500 Euro. Please note: if you want to cancel or postpone your appointment you must do so 48 hours in advance. Consequently, a cancellation fee may apply.